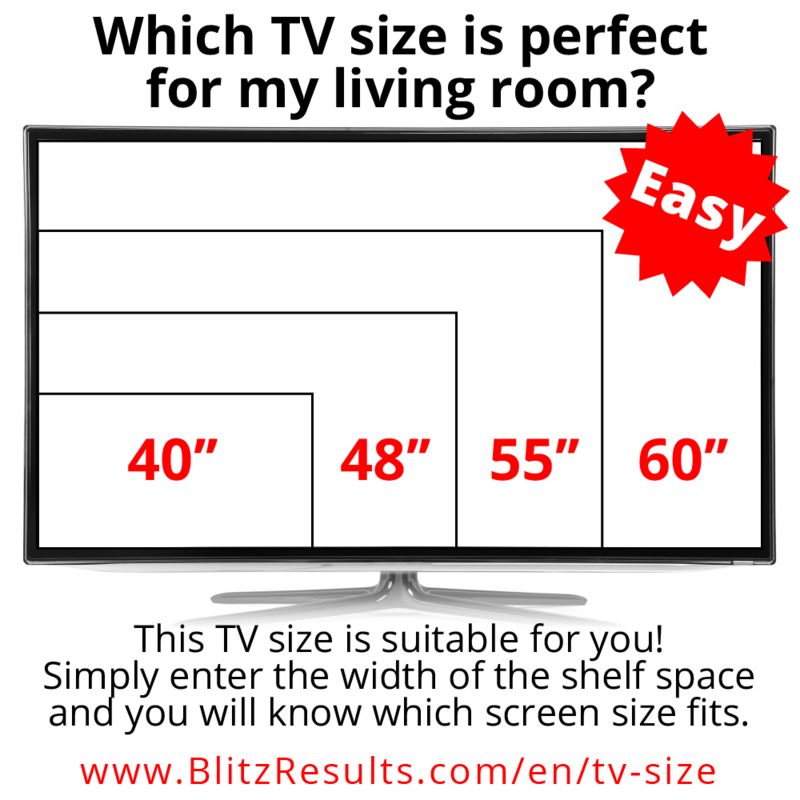 Which TV size will fit on my shelf? Is it only suitable for a 32-inch television or is the large 55-inch television also an acceptable choice? With our converters below, you can easily find out the best answer! Television sizes are generally labeled according to the screen diameter, which is the length of the diagonal of the screen. This is the distance between the opposite corner points of the screen. The optimum TV size is not solely dependent on the length of the screen diagonal. In order to find the suitable TV size for your home, you also need to consider order factors such as the size of the room, the size of the TV compartment, and even the viewing distance from the seat area. Image resolution also plays an important role. It must be noted, however, that with the development of HD televisions with high resolution, buying a large TV is no longer that much of an issue for people with limited space at home. More and more television stations and cable network operators are broadcasting their programs in HD, so a somewhat smaller viewing distance is not that much of a problem today. If you plan on buying a new TV, you should definitely choose a device with the 16:9 aspect ratio format, which is currently used by most flat screen TV units. The viewing angle remains an important factor for 3-D television. Real 3-D enjoyment is only possible at an angle of around 75 degrees. Television sizes are generally labeled according to the screen diameter, which is the length of the diagonal of the screen. This is the distance between the opposite corner points of the screen. It is usually measured in inches although there are brands in some countries that use values in centimeters. Attention: Vendors can get very creative when it comes to tricking their customers. Sometimes, labeling and market promotions use housing dimensions instead of the actual screen size measurement. This is hardly noticeable with devices with narrow frames at first glance. However, those who take a closer look will see the clear difference in dimensions. The optimum TV size is not solely dependent on the length of the screen diagonal. Comparing sizes based on this standard alone is only possible when devices with the same aspect ratio are concerned. And so, in order to find the suitable TV size for your home, you need to consider order factors such as the size of the room, the size of the TV compartment, and even the viewing distance from the seat area. Image resolution also plays an important role. For example, screens with SD resolution should be smaller or the distance should be larger. Otherwise, individual picture pixels become visible, which may negatively affect the viewers’ enjoyment while watching television. With HD-resolution devices, this qualitative problem hardly exists, which allows the purchase and use of TVs with larger screen diagonals even for areas with smaller seat spacing. What role does seat distance play in the television experience? It is worth knowing that all screens of the same class initially have the same number of pixels. But depending on the resolution in SD or HD, only fewer or more pixels are displayed, which may contribute to an apparently poorer image quality with a small viewing distance in the case of SD reception. The size of the screen alone provides little information about how high the image quality will ultimately be. Other factors aside from the size of the screen must be taken into account. The quality of the reception source is always decisive for the quality of the television picture. The higher the quality of the receiving source, the better the picture. For example, content in HD and blue-ray disc offers better resolutions than SD television or videos on tape or classic DVDs. The better the signal source of a high-quality television set, the larger the screen can be selected. This applies even if the distance between seats is limited, which is usually the case in smaller living rooms. A larger TV size is also worth having in such small spaces depending on the picture format. If you prefer to watch programmes and films in SD format, you do not have to buy a high-quality HD television. However, nowadays, the trend is increasingly leaning towards TVs with 4K resolution, which promise almost a real cinema experience even if there is only a small distance between the TV unit and the seats. With these highly-advanced devices, the TV distance becomes less important for picture quality. The viewing angle also remains an important factor for 3-D television. Real 3-D enjoyment is only possible at an angle of around 75 degrees. Otherwise 3-D television is hardly worthwhile. To what extent does the distance between the seat and the television influence viewing quality? “The more “area” of the field of view a TV picture takes up, the more immersive it becomes. So, ideally, you should sit as close as possible. But you can also sit too close, if you exceed the maximum resolution, i.e. if you can see the pixel structure of the TV. If even the finest details in the picture are perceived just as sharply as soon as you sit a little further away, you have sat too close. The real resolution of the image is the angle between two transmitted pixels. It is said that humans can differentiate them in about one arc minute (at 100% vision). Tests have shown that the ideal distance with Full HD is about three times the image height. However, these tests were made with PC-generated fonts, but video material is always softened (filtered) so that no moirés are visible. As a rule of thumb, we actually recommend our readers with a Blu-ray and Full HD screen to maintain a seat distance that’s triple the image height and have tried this ourselves in many long tests. For DVD content, you should sit almost twice as far away because of the lower resolution, and for analog TV or DVB-T, even further. The phenomenon is well known: An already quite large TV looks even one size bigger inside the four walls of your home. The reason for this is that without an accurate frame of reference, TVs tend to look smaller when displayed in stores as they usually have a much larger floor area. Therefore, people end up purchasing much larger sets than what is suitable for their home, especially when you consider factors like seat distance. Of course, people still prefer to buy a larger screen than what is appropriate for their home over buying a TV that is one screen size smaller. While they could get used to a larger screen much quicker and easier, a smaller one will simply appear too small and bothersome after a short time. Moreover, with the development of HD televisions with high resolution, buying a larger unit than previously intended is no longer that much of an issue, especially since more and more television stations and cable network operators are broadcasting their programs in HD anyway. Hence, a somewhat smaller viewing distance should not be that much of a problem anymore. When talking about TV sizes, the screen format must be one of the first things to consider. This refers to the so-called aspect ratio, which is the proportion of width to height. Older TV screens used to have an aspect ratio of 4:3, but today, fewer and fewer media are being broadcast in this format. The 16:9 format is currently used for flat screens. If 4:3 programs are watched using such devices, a black bar appears at each of the lateral picture edges. However, films and programs in 16:9 format can hardly be viewed sensibly on a 4:3 device. In such cases, essential picture components tend to be excluded from the display and the picture shown by the device only looks like an excerpt. So, if you plan on buying a new TV, you should definitely choose a device with the 16:9 aspect ratio format. A special format for real widescreen television is 21:9, also known as the cinema format. However, these devices are only suitable for a real home cinema with 21:9 content. For programs in 16:9 format, either the image is distorted or black bars are displayed on the left and right. For many, in addition to the attractive price, size is considered as the most important factor in making a purchase decision. Whether this is always the right decision depends on the conditions on site. As already mentioned, the distance between the seats in inches or centimeters matching the length of the screen diagonal is the most important benchmark for a good television experience. Therefore, the best decision is the one that is based on the possible seat distance in relation to the preferred screen size. Unless you’re dealing with high-definition TV and content through and through, televisions that are too small are no more fun than screens that are too big. How big should televisions be? The American unit inch has prevailed in the specification of screen sizes (i.e., screen diagonals). Often, but not always, the size information is also supplemented by an indication in centimeters. Both units of measurement are common, but differ from each other. If a new television is to be purchased, the inch value must be converted into centimeters in order to get an impression of how large the screen diagonal is and thus, ultimately, the real size of the picture as well. First of all, it makes sense to measure the space available for the new television. Armed with these numbers and the calculated optimal viewing distance, a suitably large television can then be bought. One inch corresponds to exactly 2.54 centimeters. In contrast, 1 centimeter corresponds to about 0.4 inches. The unit of length differs from the American system to the metric system in Europe. Hence, a corresponding conversion makes sense. The screen diagonal values in inches are therefore always smaller than the values for the same screen in centimeters. A television with a screen diagonal of 81 centimetres will therefore be indicated in inches as 32 inches. These are usually approximate values to avoid unnecessary decimal places. If you cannot remember the 2.54 as a conversion factor, you are welcome to memorize 2.5. While the pure conversion from inches to centimeters is based on a factor of 2.54, some standardized technical variables differ from the pure conversion factor. 40″ screen size is 101.6 cm, the device has a screen diagonal of 102 centimeters. Such deviations are common and reflect technical standards. Inch sizes are also used for tires and wheels, tube diameters, handlebar stem lengths, and many other technical sizes. Deviations in the millimeter range are quite common when harmonizing the American system in inches and the European metric system. What is the optimal TV size? To calculate the optimum TV size, the distance from the TV set is divided by a specific factor. This factor varies depending on the image quality in which the picture is usually viewed. With SD quality, it is 3.5; with HD quality, 2; and with 4K resolution, it is approximately 1.5. If you prefer the result in inches, the centimeter value is multiplied by 0.3937. If you have always wondered whether you need the Pythagorean theorem (for information: a² + b² = c²) in real life, you will be pleasantly surprised. The following formulas can be used to compare two televisions according to their size. However, it is always about the screen itself – how wide a possible frame is, is not taken into account. If the image diagonal is specified in inches, it is first converted to centimeters. This is done by dividing by 0.3937. This screen diagonal can be used to determine both the width and height of the television. However, this requires specific factors for the width or height, which vary depending on the format of the television. Once the heights and widths of the different televisions have been determined, the differences can be easily calculated. To compare the image area it helps to use the following formulas. First, the screen area of each television is determined by multiplying the width by the height. The percentage difference, i.e. by what percentage the larger TV is now larger, is calculated by dividing the difference of the screen areas by the smaller screen area and multiplying by 100%. Similarly, the price difference in percent is calculated by dividing the price difference by the price of the cheaper TV and multiplying it by 100%. Inch is converted to centimeters by dividing the centimeter by 0.3937. Centimeters to inches is converted by multiplying the inch by 0.3937. 6 What role does seat distance play in the television experience? 8 To what extent does the distance between the seat and the television influence viewing quality? 12 How big should televisions be? 14 How many centimeters are there in an inch? 18 What is the optimal TV size?